You may have heard of the 30 day squat challenge. I’ve compiled my own little 30 day challenge from all the ones that exist out there. This is my disclaimer, I am in no way a qualified sport coach or fitness instructor of any sort. This is strictly a set of exercises I have combined into one routine that so far takes less than 10 minutes to complete. Of course, I’m guessing the time will add on as the reps get higher. There is even a guide with little images I have collected depicting what I’m doing for each of these items. There are many different suggestions, such as weighing yourself, and marking down all your measurements before you begin, half way through, and at the end. If you don’t already normally do this, it’d be a good idea for you to 🙂 . This is where I’m at right now. Today, September 22, 2013, I am on a rest day – day 12 and my legs sure do feel a lot stronger when I’m doing these squats! 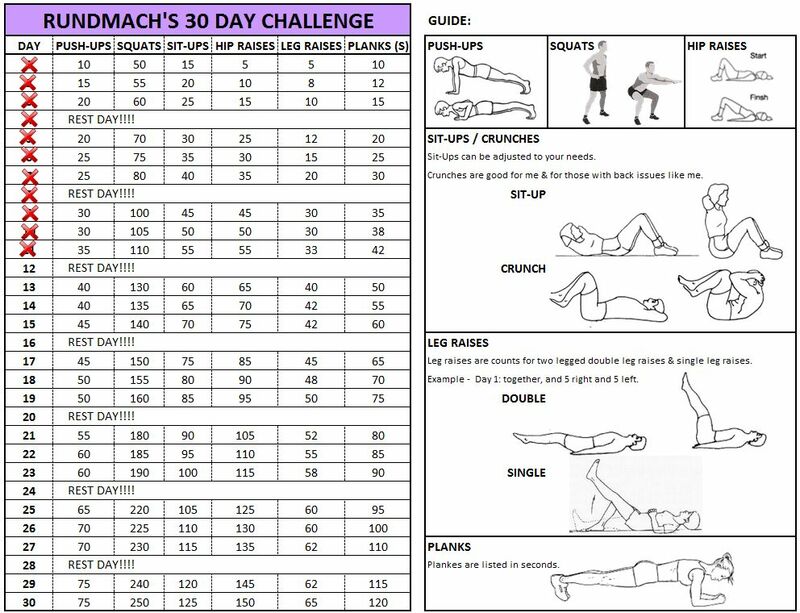 I did start off with full sit-ups (head to the knees) but my lower back started to really hurt over the next few days; by day 7, I changed my routine to crunches. I know I’m not getting the full stomach work out but my back does feel much better. Can’t wait to finish!